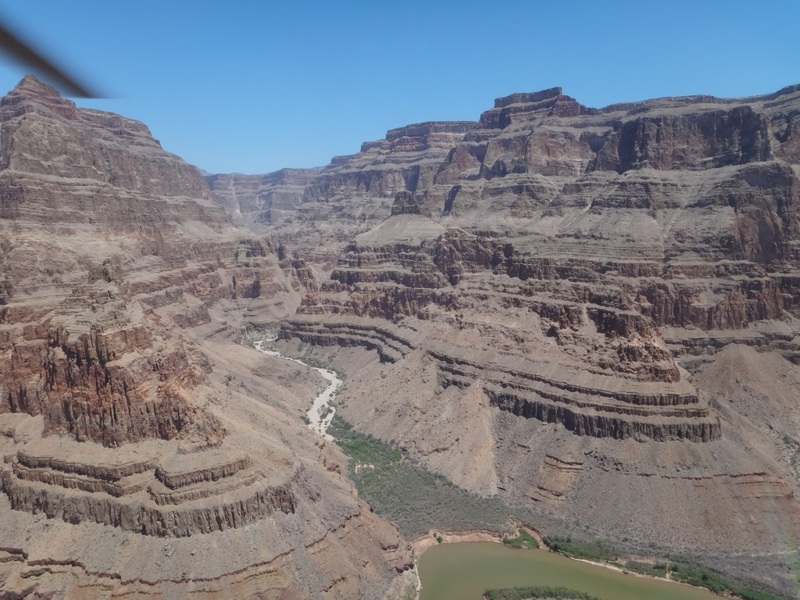 Photograph 1 - Helicopter view between Hoover Dam and Grand Canyon - the location where Thelma & Louise drove their vehicle over the cliff. Photograph 5 - View of Eagle Point. If you look carefully you see the eagle with its wings spread. The body of the eagle is the dip is in the saddle and looking from behind. 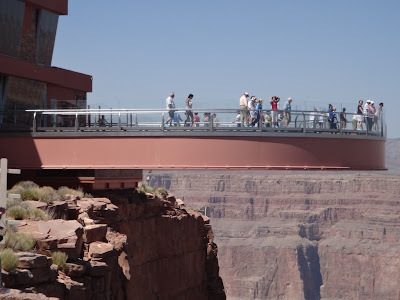 Photograph 6 - View of the famous Grand Canyon Skywalk. 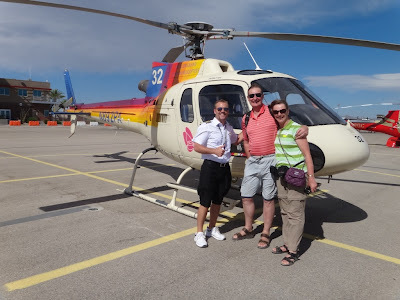 Photograph 7 - Our return to Boulder City Airport with our pilot - an excellent experience. 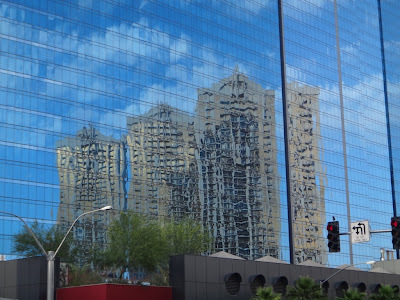 Photograph 8 - Our hotel building being reflected from the Hilton Hotel Las Vegas. Our room is on the 33rd floor in the left tower - Tower 3............................................................................................................................................................................................................................................................................................................................................................................................... Today maarks our most memorable day so far. 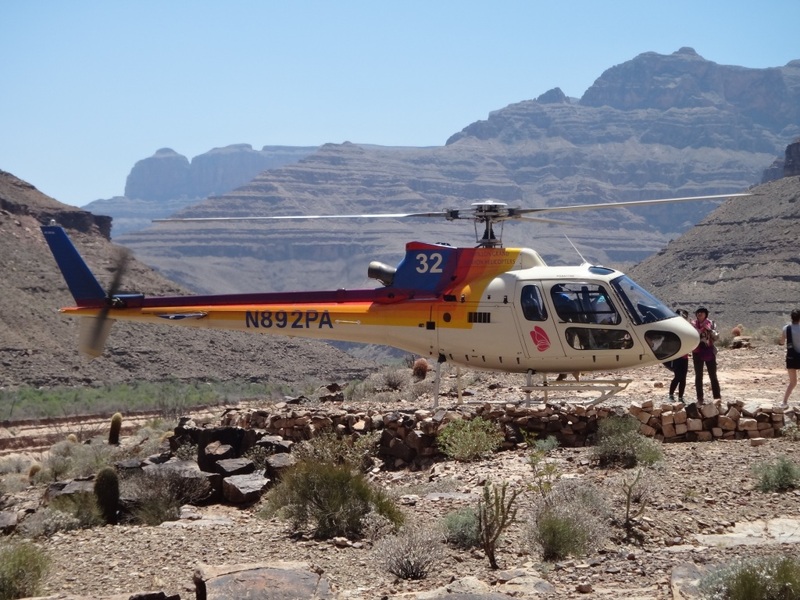 Anne had her first helicopter ride and she thoroughly enjoyed the experience. 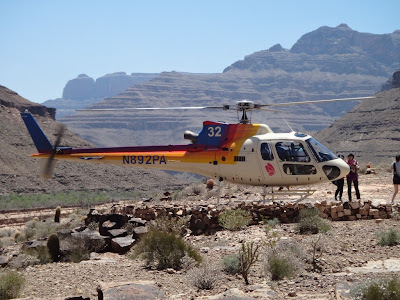 Starting at 10am we were picked up from our hotel and transported to Boulder City Airport 35mins away. The journey was through desert country and different to our Australian barren landmass. 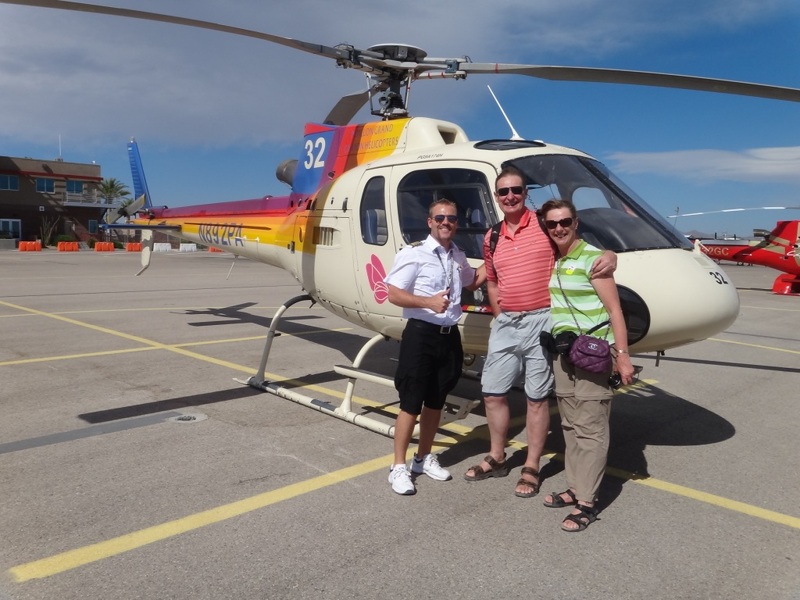 As we had VIP tickets for our tour we were given front seats to a six seater helicopter and our pilot "John" was great. 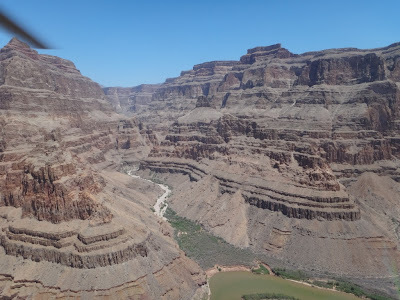 We flew from Boulder City over the Hoover Dam, Lake Mead and into the bottom of the West Rim Grand Canyon. 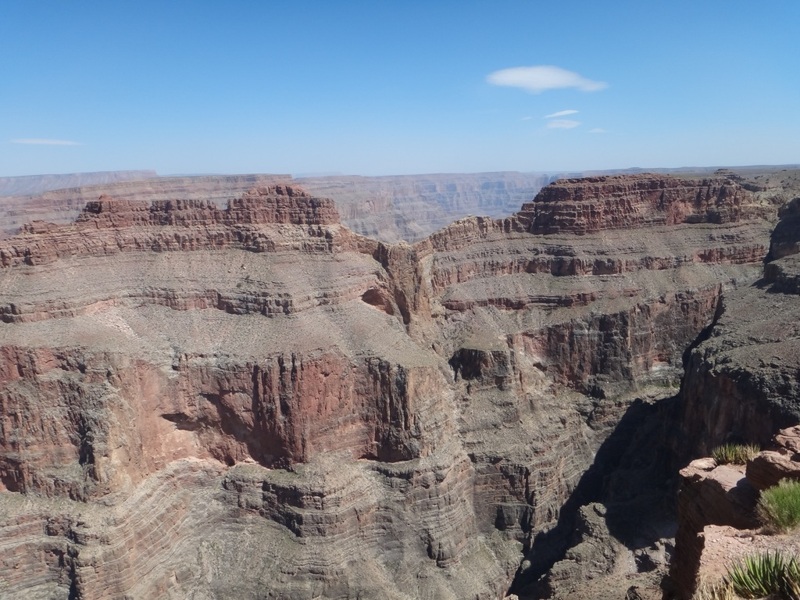 It is hard to judge the height of the massive cliffs but we were told they were one mile above us. 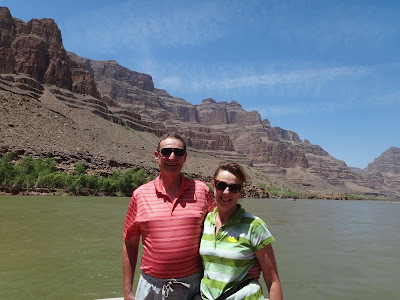 We then had a boat ride travelling a mile upstream and then floated along with the current back to our embarkation point. We took on the beauty of the canyon from below. About 1pm or there abouts John collected us from the bottom and choppered us up to the top where we experienced the Skywalk. We were given express passes and jumped the long queue. The skywalk is along a glass bottomed walkway suspended 4,000 feet above the canyon floor. It was fun watching the Asian folk holding on to almighty as they walked the length (mostly Japanese) - very similar to our Malaysian friends who also have a fear of heights. When looking down through the glass there is nothing between you and the bottom - a great experience. From the skywalk we flew back to Boulder City and hence by shuttle to our hotel returning at 5pm. 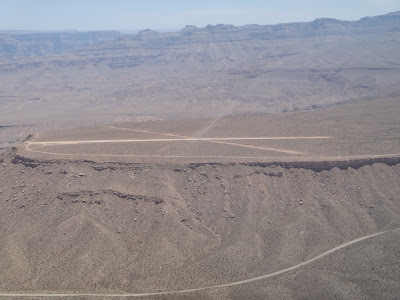 It was a bit scary today as Nevada and Arizona was under severe dust storms and the strength of the wind was above normal. There was a threat of cancelling afternoon helicopter flights that afternoon. However, we made it in okay and the flight to and fro was not bumpy. As mentioned Anne's first ride in one of these machines was a great experience. Even myself after a few hours flight time in RAAF Iroquios and Squrrels back in the eighties found the ride enjoyable. Anne cannot wait until our Manhattan helicopter ride next week. 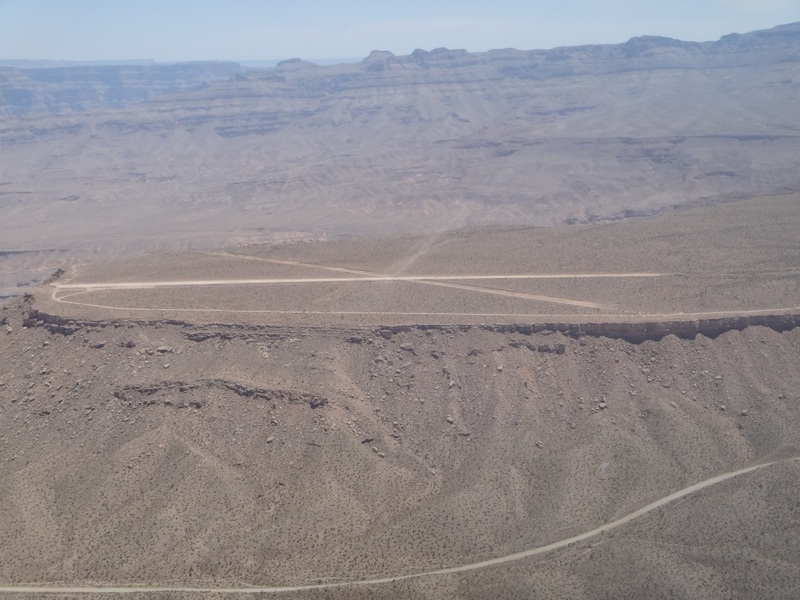 For any body who is thinking about going to Las Vegas must include a chopper flight to the Grand Canyon and the Skywalk. Our guide at the Skywalk was a young Indian girl. The land that this part of the canyon is owned by the Indians and she was very proud of what has been achieved on her land. 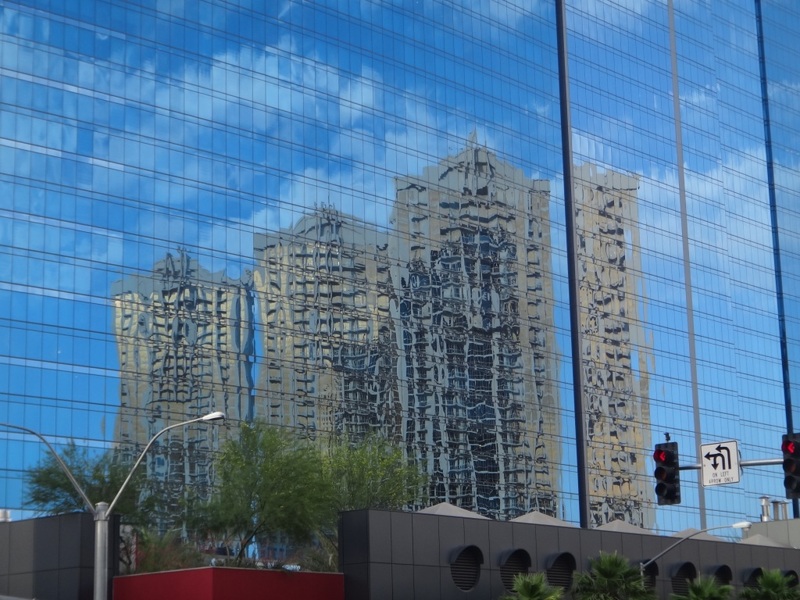 As you can see in the last photograph I have included a picture of our hotel "The Signature" though the glass fixtures of another hotel. The result is surreal. Tomorrow we will try to go up the Stratosphere and we found an address for a shop selling Ballroom Dance shoes for Anne - located nearby. So that is our plans for tomorrow plus our Dancing With The Stars show at 9pm. Cheers to all.